Penn’s Graduate School of Education has been ranked #4 in U.S. News & World Report’s 2019 rankings for graduate schools of education. 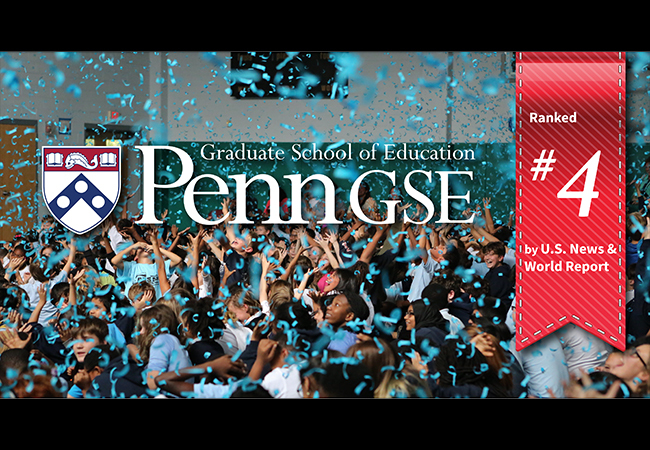 The ranking marks the seventh consecutive year Penn GSE has been in the top 10. For the 10th straight year, Penn GSE's leadership in the world of education policy has been reflected with a top-10 position in the specialty rankings. In their categories, the Education Policy Division ranked #6, and the Higher Education Division ranked #9. Penn GSE also debuted in the Administration/Supervision specialty rankings. “It’s an honor to be ranked so highly by U.S. News & World Report,” said Dean Pam Grossman. "At Penn GSE, our students and faculty are dedicated to the idea that education can create opportunity in communities across the country and around the globe. In our 2nd century, we continue to be one of the most innovative schools of education in the country. What hasn’t changed is our commitment to preparing the next generation of transformational teachers, leaders, and scholars to put the cutting-edge research of our faculty into practice and to generate new understandings of their own." Grounded in a commitment to research backed up by $53 million in funded work, Penn GSE is an Ivy League school finding solutions to the challenges facing education. With one of the most selective Ph.D. programs in the country, Penn GSE has fewer than two doctoral candidates for every faculty member. Students have the opportunity to work closely with the scholars and practitioners leading the conversation about the future of education. Master’s students benefit from a rigorous atmosphere that emphasizes real-world applications for every lesson. Students in Penn GSE's Urban Teaching Apprentice Program spend twice the average amount of time in schools, working closely with mentor teachers. Penn GSE also offers a range of executive-style degrees that prepare professionals to be thought leaders and innovators in the evolving education landscape. Graduates join an extensive alumni network that includes teachers and leaders, entrepreneurs, and college presidents.